Eight different forms of magnesium for optimal assimilation. Recognized benefits against constipation, digestive problems, and gastric hyperacidity. Nutritional supplements contain magnesium in a number of forms, but they are not all optimally absorbed by the body and some of them can cause intestinal discomfort. 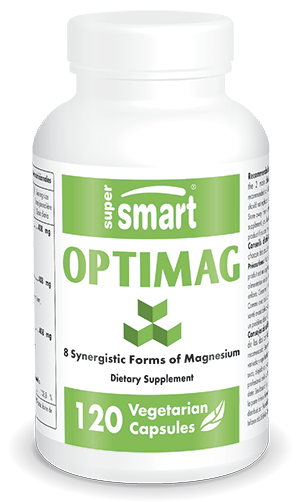 This new OptiMag formula combines eight forms of magnesium, ensuring optimal use by cells and increased digestive tolerance. • it reduces stress by preventing increases in cortisol. It is estimated that over 75% of the population is failing to consume recommended amounts of magnesium, even without considering its over-use by the body as a result of stress. Low in magnesium, the refined foods of modern diets make it the most common micro-nutritional deficiency. Added to that are various aggravating factors: age, daily over-exposure to noise, some drugs (diuretics) and diseases (diabetes, digestive or kidney diseases), and too high an intake of fatty foods and alcohol. Lastly, any kind of stress, be it acute or chronic, initiates a significant release of adrenalin which produces a more severe muscle contraction when magnesium is seriously deficient. This contraction is accompanied by a flushing of magnesium from muscle cells to the blood, resulting in its loss via the urine. Since magnesium deficiencies significantly increase vulnerability to stress, the result can be a veritable vicious circle. Signs of deficiency include loss of appetite, nausea, vomiting, fatigue, weakness, muscle tension, irritability, insomnia, headaches, dizziness, anxiety, emotional outbursts, feeling like you have a lump in the throat or stomach, and palpitations. More severe deficiencies can lead to muscle spasms, contractions and cramps, and problems with mood and heart rate. In all cases, supplementation is vital, though it must be borne in mind that restoring normal levels of magnesium from a state of deficiency can take between six weeks and six months of supplementation. • and taurate which facilitates the re-entry of magnesium into cells just as it is being flushed out, as a result of stress for example . • bisglycinate, a non-ionic form with perfect stability and no negative effects on intestinal walls. Overall, the eight forms of magnesium in OptiMag are non-irritating and tolerated by those with a sensitive stomach, unlike the hydroxide and oxide forms (such as marine magnesium), that have much more irritating and laxative effects over the long term . Taking four capsules a day, in two doses with each main meal of the day, provides 100% of the recommended daily amount of magnesium, ie 400mg elemental magnesium. Adults. Take two capsules with each of the two main meals of the day.